The designs of Clarice Cliff are among the most striking and collectable ceramics produced in the 20th century. Angular and uncompromising, embellished in strident primary colors, they were a sensation when they appeared in the 1920s, capturing the spirit of the Art Deco movement. Her teaware is as sought after today as it was then, her most collected designs, such as her Bizarre ware, commanding high prices. 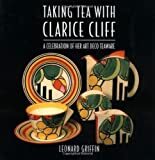 This beautifully photographed book evokes the mood of the Art Deco era as it conveys the enormous charm and range of Cliff's work in china tea services. It offers a complete record of her teaware designs as well as a fascinating look at her life and work.